VERIFONE'S PINpad 1000SE provides the perfect solution for acquirers, processors, and merchants looking to capitalize on the rapid growth of debit, EBT, and other PIN-based transactions. Easily connecting with most existing POS terminals or electronic cash registers, the PINpad 1000SE offers a fast, simple way to be able to accept the latest in PIN-based payment. The PED-compliant PINpad 1000SE puts merchants on the card industry's leading edge by incorporating a broad array of sophisticated security features to guard against fraud and abuse. This includes full support for the Triple DES (3DES) encryption standard, and a choice of Master/Session or DUKPT (Derived Unique Key Per Transaction) key-management methods. The PINpad 1000SE also supports MAC (Message Authentication Code). This technique protects the debit transaction data from accidental or fraudulent tampering during the transfer to its host. The PINpad 1000SE features improved ergonomics with large, hard-rubber keys for ease of use, and a sleek new design that fits in the palm of a hand. 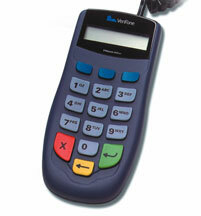 The device is rugged and reliable, built to withstand the hard knocks at the point of sale. Most importantly, the PINpad 1000SE is fully compatible with the legacy PINpad 1000 and PINpad 101 families. Full 3DES security and sophisticated key-management schemes protect PIN-based transactions. Enhanced ergonomics minimize customer errors and improve ease of use. Connects with most POS terminals and ECRs, and offers full backward-compatibility. Offers secure, reliable PIN input for the expanding range of debit, electronic benefits transfer (EBT), and other PIN-based transactions. Supports the full range of 3DES security options, including 3DES Master/Session keys and 3DES DUKPT. Provides higher level of fraud protection against potential attempts to "crack" single DES keys and access secure data. Is PED-compliant for secure solutions meeting the PED standard. Meets ISO and ANSI standards for PIN encryption, key management, and Message Authentication Code (MAC) - ANSI X9.8, ANSI X9.24, and ANSI X9.19, and ISO 9564-x, ISO 11568-x, and ISO 13491-x. Provides mode for clear-text entry, to support petro fleet applications and others that don't require PIN entry. . Features a stylish, ergonomic design that occupies less counter space and fits comfortably in the palm of a hand. Has large, hard-rubber keys that provide better tactile feedback, minimizing errors and making the PINpad 1000SE easier to use for consumers of all ages. Includes function keys that can be programmed as "hot" keys for special tasks. Provides eight-character, liquid-crystal display that is simple to read on a countertop. Display shows up to 16 characters through automatic scrolling, and supports multiple languages. Can be used with existing PINpad 1000 stands, and wall- or counter-mounting hardware. Is fully backward compatible with PINpad 1000 and PINpad 101 legacy families. Works with payment terminals, PCs and electronic cash registers (ECRs). 8-character, liquid crystal display; shows up to 16 characters through automatic scrolling. Supports asynchronous 1200, 2400, 4800, and 9600 baud. Encryption fully supports emerging 3DES standard. Key-management methods allows choice of master/session and Derived Unique Key Per Transaction (DUKPT) methods. shipping weight 0.33kg (0.15 lb.). 0° to 40° C (32° to 104° F) operating temperature; 15% to 90% operating humidity, non-condensing. 6-14 VDC, maximum power 0.3W.